LAS VEGAS — This goal-mouth scramble might have had some real bite to it. Nashville defenceman P.K. 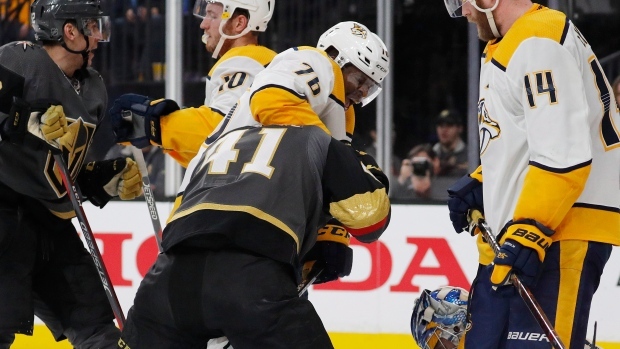 Subban accused Vegas forward Pierre-Edouard Bellemare of chomping on one of his fingers during a scuffle late in the second period of the Predators' 2-1 victory Wednesday night. Bellemare wasn't penalized — but Subban was after the defenceman got into it with Vegas forward Ryan Reaves a few moments after the initial skirmish. Subban was called for roughing and unsportsmanlike conduct, while Reaves was also penalized for unsportsmanlike conduct.